Visit the Equal10 Event to get your hands on this beautiful half up half down Style! Move over winter because Summer is moving in!! With the changing of the season you get loads of new items and REIGN just doesn’t have room for them all!! We are having a 50% off storewide summer sale and making way for more great items to beat the heat on your feet this summer! 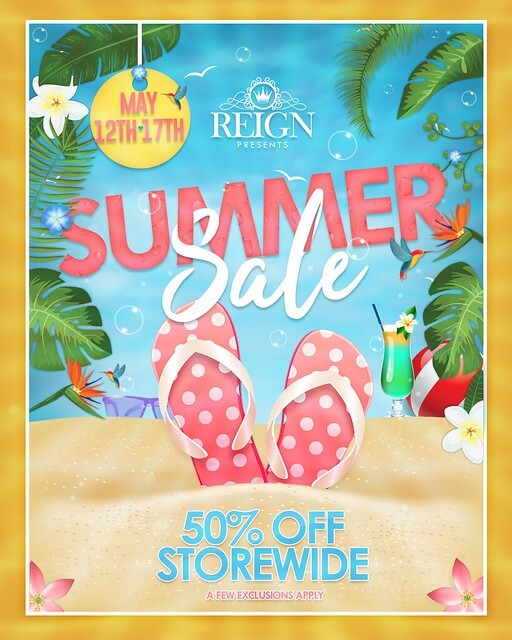 Visit the Reign Mainstore and Grab up some goodies at 50% off. The Saturday Sale is Off and Running this week with some amazing Saturday shopping deals for you!! BESOM has this cute little Cheeky Bun for 75L a Color pack that could not be more perfect for summer! Visit the BESOM MAINSTORE to Grab it Now! THE REIGN LACIE KNOTTED PLATS! Available at the BESOM MAINSTORE for FLIRTY FRIDAY. Sold in two Separate packs for solid colors or Patterns and fit to match perfectly with the Besom Josie hair out now for Fifty Linden Friday. TWO AMAZING ITEMS ONE LOW PRICE!! 50L!!!! GET THEM NOW! Get The Ossia Platform Sandals at the Mainstore Now!! The 6th Anniversary of Fameshed Is Here!!! The May round marks 6 successful years of the Fameshed event being a part of secondlife. Reign and Besom could not be happier to take part in this momentous occasion. These Sassy Chunky Heels come with The following options. 6 Different Color packs, an Essentials pack, and a Buy all pack available for purchase.